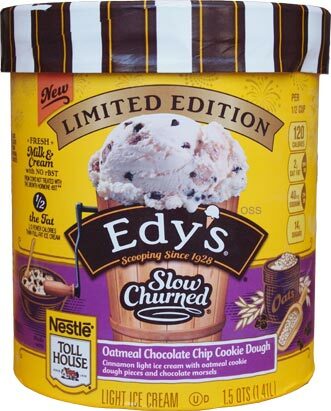 [New for 2017] Edy's (Dreyer's) has released three new cookie dough inspired flavors and the first one I had, double chocolate chip cookie dough, was terrible. This version can't be any worse right? Is there anyone out there who enjoys these tiny little chocolate chips? I'm being serious. Ugg, it suffers from the same odd, solid dough chunks that double choc did. They might be a little softer, but still nothing very enjoyable. At least there is a little bit of lingering oatmeal cookie aftertaste so that's a positive. It also suffers from that odd, slow churned, food science light ice cream texture that always makes me hesitant to pick up an Edy's flavor. The particular base flavoring puts that texture funk on full display. It's supposed to be cinnamon flavored but it's super mild and does nothing to distract you from the texture. I finish up my serving which thankfully has several dough bits to distract me from all the shortcomings here. At least I don't hate this one, but it still seems like a fail to me. Sure, if you are an regular Edy's fan, you won't mind this one, but I can't see anyone else grabbing this outside of sheer curiosity. On Second Scoop: While not truly terrible, this one just isn't worth your time. Maybe as a grand ice cream with softer chunks it would have been half-decent, but this one is just foolish and meh. Thankfully my wife finished it off for me because I have no further interest in it. 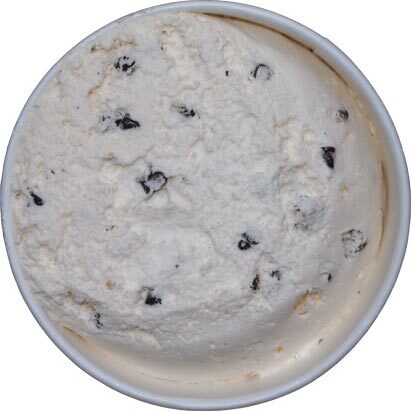 Why did Edy's add chocolate chips to this flavor? 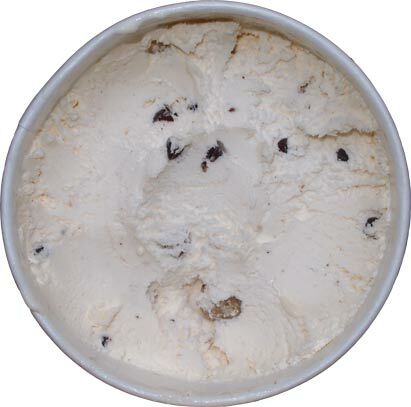 Oatmeal raisin cookies almost never have chocolate chips in them so this ice cream does not need them either. Just because it has cookie dough in the title does not mean it automatically needs chocolate chips. @Latchkey: There has to be a large contigent of people that avoid Edy's at this point right? @Stride: iunno, B&J did the same thing. I wish they wouldn't. Spice things up. I would have liked the chocolate pieces if they'd been milk chocolate but I felt like the dark chocolate overwhelmed the cinnamon base. And yes, the hard/overly chewy oatmeal cookie pieces were incredibly disappointing. not a bad idea. some soft milk chocolate pieces would definitely go better here (though adding a lot more cinnamon would also help). On the B&J review, someone mentioned maybe butterscotch chips or white chocolate chips, something a bit different to spice things up. 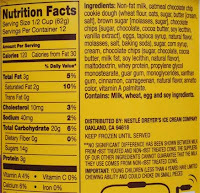 How can a half cup contain only 3 grams of fat?!? This isn't ice cream at all. I don't know what to call it, but its like bottom of the barrell flavored ice milk. Are you kidding? This is one of the best flavors I've had in a long time (I'm not even joking - I really like it!). The cookie dough bits are delicious when slightly softer like this, and the oatmeal flavor adds a cinnamon-iness that I enjoy. I'll be the voice of dissent and say raisins do not belong in oatmeal cookies (or any others, really), and chocolate chips oatmeal is the best. Also, I don't get any "funk" from "slow churned" recipes. In fact, I think it's actually what we should be applauding food companies for doing, even if it's not your cup of tea. Instead of all the sugar replacements or artificial sweeteners or just simply reducing the fat and pumping up the sugar, slow churned technology simply breaks the fat up into smaller blobs to allow lower fat ice cream to punch above its weight. I, for one, am all for this technology. 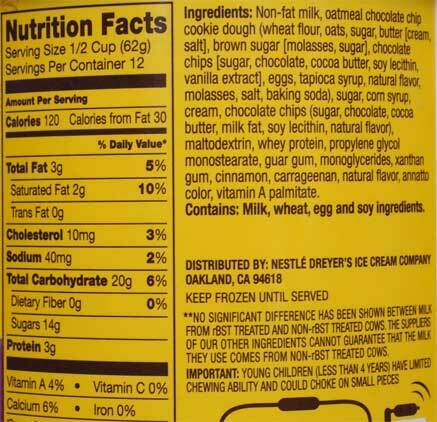 Ice cream is a quintessential product of food technology. As for this particular ice cream, which I bought for the first time tonight, I'd say it's pretty "meh" as an ice cream flavor, but "decent to good" as a low fat ice cream. That's not totally insignificant. We can't have all the fat all the time. I think the main thing the slow churned line suffers from is that they want to keep it as "skinny" as possible and skimp on the mixins. I wish they'd slow churn the ice cream, but then add a hefty amount of mixins. It'd still be much lower fat compared to flavor made with full fat ice cream. As I've mentioned recently, this is yet another reason I so miss the "premium" Haagen Dazs Light ice cream pints that used the slow churn technology. They were damn fine clones of the same non-light flavors, with a caloric profile more along the lines of a non-premium pint. Question: Where did you find this flavor, on a clearance rack or discount store? It's good that the way you interpret textures isn't bothered by slow churn tech, but for some of us, it does. I'll take a random guess that you are a younger fellow because us old folks remember the days where ice cream was a handful of components and it was magnificent. The current spate of "light ice cream" using churn style are often laden with chemicals and stabilizers and it drives some of us (like me) crazy. I in no one encourage having super premium ice creams all day, every day, i just think there are better choices. I hate to pick on the horse that is deceased, but something like an all natural turkey hill flavor has similar calories without the funk. Sure, it doesn't have a ton of mix-ins, but I like a clean simple product to end my days.